We are living in a world dominated by technology and almost everyone has their own personal computer. We all spend long periods of time at our desks staring at a computer screen, so shouldn’t we be as comfortable as possible, both at home and at the office? Whether you’re browsing the net, playing games, shopping online or getting some work done, finding the right computer chair for you will make the leisure activities more enjoyable and the time spent working more productive. I have compiled reviews of 3 of the best computer chairs on the market. Some are luxurious, while others are a bit more budget-friendly. Let this be a little introduction to help you decide which computer chair is best suited for you. The Eurotech Ergohuman Mesh Ergonomic Chair is one of the best computer chairs out in the market, as it features 8 ergonomic adjustments for maximum comfort. Some adjustable functions include tilt tension control, tilt lock, back angle, back height, synchro tilt, seat height, seat depth, and arm height. Controls are easy to reach and are adjustable in every way possible, as a result you get maximum comfort and satisfaction no matter how long you are sitting. 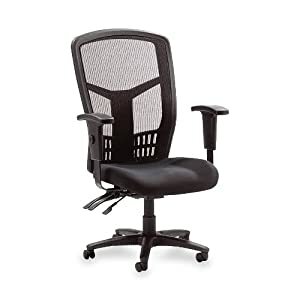 Customization is especially important for computer chairs as leaning forward without proper support to see a computer screen is one of the top ways to injure your back and have discomfort in your lumbar region. The Ergohuman is also made up of chrome base with nylon casters that makes it easy on the carpet. The wheels are comprised of plastic, but are large and have a rubbery material covering them, which makes them easy to slide on a chair mat. The mesh seats and back are easy to maintain and are designed to resist staining, prolonging the life of the chair. Most people who work overtime or serious gamers like to eat while they work/play, with this chair they can continue to do so for long periods of time while not worrrying about damaging the chair. It is also made up of sturdy polished aluminum, mesh and plastic parts, which makes it very sturdy and durable. Its components are made up of 97% recyclable materials so you can feel good about being green. This chair meets and even exceeds BIFMA standards and is also certified by Greenguard Indoor Quality. Actual assembly is very simple and it will take you only 20 minutes to put together. Eurotech warrants the original purchaser all components for the life of the product except the upholstery and foam, which are warranted for five years. This chair also comes in a few different colors to match your interior design choices. If you have the luxury to buy this excellent chair, you can get the best price on Amazon, which is about a 50% from its original price. The Ergohuman also has a respectable 4 star review on Amazon. The HON VL700 Series High-Back Chair is one of the most affordable computer chairs out on the market. This chair is made in the USA with only the highest quality materials, featuring customizable controls and a very affordable price, making it a good investment for offices looking for sophisticated chairs at a great price. One of the best features of this chair is its premium synchronized knee tilt control that helps users keep their feet on the floor while reclining. This chair also has an infinite tilt lock that can be locked in any position to accommodate users of all different sizes. This chair is composed of both mesh and leather, with the back made up of mesh while the seat is wrapped in luxurious black leather. The breathable mesh back also features adjustable lumbar support to comfortably cradle the lower back. The armrests are also adjustable to support the arms at just the right height for typing or mouse manipulation, avoiding shoulder strain. The frame and base are molded from reinforced resin for longevity. The seat is thickly padded for additional comfort. This chair is very easy to assemble, instructions are especially detailed and easy to understand. The best part of this chair is that it is covered by a HON 5-year limited warranty, so you are assured that there will be someone to answer your queries and assist you with whatever you need. The HON VL700 is available on Amazon at a lower price than its listed in-store price. Customers are so satisfied that they have rated it with a commendable 4.5 out of 5 stars. The bottom-line is that this chair is very efficient, stylish, affordable, and gives you great comfort for either your office or your home. The Flash Furniture GO-977-1-BK-LEA-GG is the most budget-friendly of the 3 computer chairs we reviewed. Its price of less than a hundred dollars is certainly good enough reason for you to buy this chair if you are concerned about cost. Don’t let the price fool you, the materials used for this chair are still sturdy and durable. Its leather wrapping makes it very appealing and professional-looking for office use. The mid-back design makes it a perfect computer chair, especially if you have a smaller work space. This chair can be adjusted in height and can also be tilted. It is also made with a foam core to make it especially comfortable for the users. The armrest are padded for comfort and the only con is that they are nonadjustable, which is not the ideal option if you want something tailored to your needs. But if you’re just looking for a decently supportive and affordable chair, this is a great choice. Another thing to watch out for is the difficulty of putting the chair together. The screws are notably hard to tighten with the hex wrench included. But once all the screws are all the way in, this chair is rock solid and will be worth the money you paid for and time well spent. Aside from a few minor details to watch out for, this computer chair is still worth buying because of the great features that come with the low price. It is available on Amazon and was rated 4 stars out of 5 by customers who bought it. A supportive, cushy office chair isn’t just a must for your work life. For those working at home, personally or professionally, an uncomfortable, poorly supportive chair is a major fail. Most of us use a computer at a desk in our homes to finish up extra work, play computer games or deal with personal business matters. There is no reason why our home work environments shouldn’t be just as comfy as our office ones. When selecting the best home office chair, it is important to look at all the same features you might consider for your work chair at the office. I have compiled a list of 3 home office chairs that I think are especially well-featured and affordable. I selected these options from a range of price points so there is a little something for every budget. The Herman Miller Mirra Home Office Chair is a little slice of pure reclining heaven. Even though it is one of the most expensive home office chairs on the market, Mirra easily proves it’s worth the hefty price tag with the top-grade features it offers and the high level of overall consumer satisfaction. This chair features a suspended mesh bottom that supports the user in perfect balance. It molds to the shape of your bottom, instead of forcing your derriere flat, like a regular chair. The arms are also soft, unlike most chairs which use hard plastics that can cause discomfort. The armrests also twist inward for added customization, in addition to the fairly standard height adjustment function. With its total back support feature, you also won’t ever need to adjust this chair. The elastic TriFlex back supports the entire spine and adapts to each person’s size and movements. Another nice feature is its Passive PostureFit performance, which is an incline shape at the back that provides especially comfortable support to the lower spine. This feature works in tandem with the adjustable lumbar to keep your back supported and naturally reposed. The custom seat has an air weave suspension, which follows the form of the body, distributing the pressure evenly and providing natural movement and flow. The Flexfront seat edge is one of the new features to the market, allowing sitters to lean forward without adjusting the seat pan, which results in eliminating the gap between the seat and backrest. The harmonic tilt creates a pivot point at the hip, knee and ankle which allows you to be mobile, reducing the tendency for the body to become stiff. The chair’s base and wheels are also composed of advanced spring technology, which make it particularly easy to maneuver. Consumers also can’t get enough of the stunning modern aesthetics of the design. Mirra has a clean and light design that reveals the exceptional features and functions. It also offers colorful choices for the backrest and seat suspension that allows the user to mix or match to complement their other interior design choices and furnishings. You’ll need to be prepared to open up the purse string, but if you have the luxury of a sizable budget, you will not regret bringing the Mirra to your home office with all the features and functionality it offers. It is also rated 5 out of 5 stars on Amazon. It just doesn’t get much better than perfect. Total Back Support – No adjustment needed. The pliable, elastic TriFlex back supports the entire spine and conforms to size, posture, and movements. Passive PostureFit performance. A camber shape at the base of the back gives healthful, comfortable support to the lower back below the beltline. Custom Seat Comfort – AireWeave suspension. This elastomeric suspension seat follows the contours of the body, distributes pressure evenly, and provides aeration. FlexFront seat edge. The sitter adjusts the seat depth without moving the seat pan; there’s never a gap between the seat and backrest. Aesthetic Appeal – Innovative look. Mirra has a clean, light-scaled design that reveals the chair’s features and function. Colorful choices. The backrest and seat suspension come in a range of colors that mix or match to complement interiors and other furniture. Traditional touch. The Office Star Space Professional Chair with Eco Leather Seat and 2 to 1 Synchro tilt control offers a well-featured home office chair for an affordable price. Our favorite feature is the eco-leather seat with mesh siding for comfort and excellent breathability. The seat cushion is especially comfortable and sewn with heavy gauge stitching so it is made to last. The casters are more than adequate as they roll easily and freely, without getting stuck. All material parts used are especially durable and look well-built. The mechanical levers are also well placed, which makes adjustment easy and intuitive. This home office chair is a firm-back and lower lumbar support type of chair, so do not expect it to be as adjustable as some of the more expensive models. If you prefer overstuffed and multi-adjustable chairs, this is not the one for you. Assembly is also simple, quick and doesn’t require a degree in engineering to figure out. Overall, you get a great value home office chair that is both durable and comfortable, without blowing your budget. The Flash Furniture High-Back Black Leahter Exective Office Chair with triple paddle control is one of the best home office chairs that is both affordable and equipped with a ton of must-have features. The Flash is made up of black leather-soft upholstery, which is a composite of leather and polyurethane for added softness and durability. The black leather gives it a high-end and professional look. Its foam core is also CA117 fire retardant as an added safety feature. The armrests are made of nylon padding, which makes them soft and comfortable for your forearms and elbows. They are also adjustable to fit your height requirements, which is one of our favorite bonus customization add-ons. The most valuable feature of this chair is the controlled lumbar knob, which allows you to increase and decrease the pressure provided to your back. Another one of its unique features is the triple-paddle control mechanism, which controls your seat height, back tilt position and knee tilt. This advanced control mechanism allows you to find the perfect adjustment for your body to give you maximum comfort and support in your home. Although most office chairs offer the back tilt adjustibility, not many offer knee tilt. This function keeps your feet firmly on the floor, even when reclining, which is a major highlight for this chair. I find this home office chair to be especially comfortable and well-made for its price range. It has a 4 star rating and 217 reviews, so you can be sure you are purchasing a well-received, good-quality product. This is the most durable and affordable of the home office chairs in this guide and a solid choice for those seeking a chair with top-grade bonus features. Whether you have a home office or a company office, if you’re seeking an office chair, you’re looking for something that is, first and foremost, comfortable to sit in. While searching, it is easy to get bogged down in the myriad of options available, and feel overwhelmed sifting through the mixed reviews most of them receive. None of which really help you identify the perfect chair for your support needs, your aesthetic or your budget. I was in the same position, which is exactly why I made this list – to help other people find the most comfortable office chair to support their lumbar needs, provide the range of features they like to enjoy and still stays within their preferred price range. When comfort is your priority, the features, construction and build of the chair make all the difference. I have reviewed 3 of the most comfortable chairs in the market: the acclaimed Aeron chair, the Boss Black LeatherPlus Executive chair, and the Viva Multi-Office chair. My personal pick, budget aside would be the gold standard, Aeron. However, if price is a consideration, the Viva Multi-Office is a solid and stylish runner-up. Read on to learn about the specs on each and to determine which is the best option for your needs. The Aeron chair by Herman Miller is almost infamous in its reputation as standout chair in terms of design and ergonomic ingenuity, it is also one of the most expensive options you will consider. If you are looking for the best all-around and most comfortable chair, this is what you’ve been searching for. You hardly even need to read further. If price is no object, just buy this beauty and rest easy. 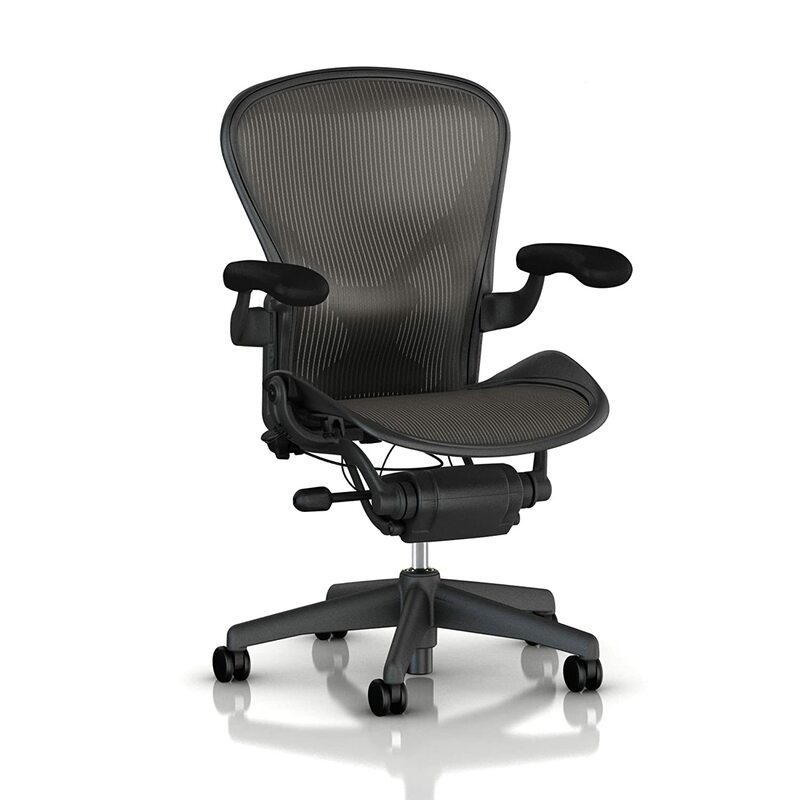 The Aeron chair is an ergonomically-designed executive chair that is made up of high-tech mesh fabric. The Herman Miller company has made sure that this chair will adapt and adjust to fit a person’s size, activity, posture, etc. all day long. One of the primary reasons this chair is so comfortable is PostureFit, the special technology the HM geniuses developed to support the way your pelvis naturally tilts forward, allowing your spine stay aligned and avoid back pain and discomfort. With its high-tech, patented mesh fabric, you can also be sure that it will not look or function like your other conventional chairs. The patented material distributes the pressure of the seat against your body evenly, keeping you airily cool and comfortable, no matter the environment. As mentioned, this chair is a bit on the expensive side but, if you buy this chair on Amazon, you can score it for a lower price. Considering the amount of money you’ll shell out for this chair, I understand if you have some inhibitions about taking the plunge. But with the all-encompassing 12-year warranty of Herman Miller, you know you will get great service and a superior product. 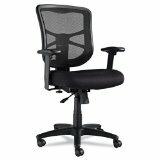 The Boss Black LeatherPlus Executive chair is a top-grade ergonomic chair that provides top-level comfort for the user. It has excellent lumbar support and pneumatic seat height adjustment, which is ideal for customizing the chair to suit individual needs and preferences. There are 2 colors available for this model – black and gray. The waterfall seat design is thoughtfully constructed to lessen fatigue on the legs and remains comfortable even during periods of prolonged sitting. The chair is made of leather, which adds to the stylish look. In terms of durability, the materials used are of good quality and possibly better or at par with most others on the market. The lumbar support is one of the highlights of this chair as it extends all the way up to the headrest. The lumbar support, for me, is the main reason why this chair is one of the most comfortable office chairs out there. Imagine sitting in your office for more than an 8 hour stretch and you’re tired, the additional lumbar support the Boss provides is worth every penny. The added padding also makes it extra soft and comfortable. 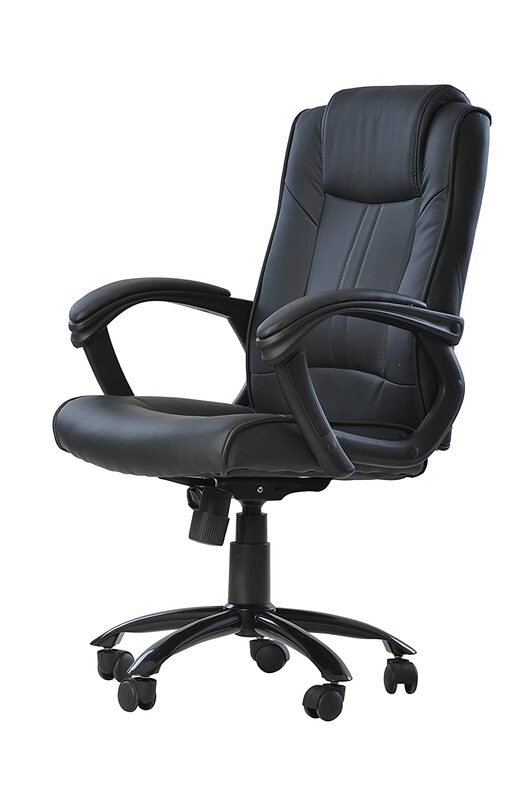 The Boss Black LeatherPlus Executive chair also has a recline feature. It may not be a priority for most users, but it’s a nice option to have for when you need a quick break. Fair warning though, if you are below 5’6” there’s a chance that you won’t be as comfortable in this chair as it can be a bit too big for petite frames. But if you’re tall, then this chair will be an excellent fit. The construction of the Boss is especially noteworthy, considering the price point. Most purchasers find this chair easy and quick to assemble. If you’re looking for a top-level chair and don’t want to shell out more than 200 bucks or so, then this is an ideal option for you. You can score this chair at an affordable price on Amazon, you are getting a stellar deal. Viva is a professional office furniture supplier that produces excellent office chairs. All of the Viva office chairs have passed the BIFMA (Business and Institutional Furniture Manufacturers Association) standards for all applicable features so you know you are purchasing a top-quality, high-performing product. This chair has dimensions of 66.9 x 27.2 x 44.9 and weighs around 59 pounds. It comes only in black and the material used is bonded leather. It has a high-back ergonomic bonded leather recliner-style body with height adjustment, adjustable depth lever and reclining incremental footrest. The Viva office chair is not just for sitting in at the desk to work, but also allows you to fully recline into a sleeping position, the ultimate in comfort. In addition to the reclining back, this chair has a footrest that can extend far enough to support the lower legs and feet. The footrest is tucked up under the seat when not in use. Its lumbar support is soft and naturally curved for your back. The texture of the black leather is thick and soft which looks especially luxurious. The locking wheels at the base of the chair allow you to roll or stay in one place. The cushions of the chair are nice and firm, so it feels very supportive and comfortable when working for long duration. The back of the chair has a built-in, leather-covered pillow-top that helps to cushion your head and back when enjoying the recline function. When assembling the chair together, it is highly suggested to have a second set of hands to help with attaching the back of the chair to the base. Since the cushions are thick, you will need one person to hold the two pieces together, while the other puts in the screws. Once assembled, it is a strong and sturdy chair that purchasers laud for its longevity. Bottomline, the best feature this chair has to offer that other similarly-priced options don’t, is its fully reclining back and footrest, which is stellar for those who work late hours and need a comfortable way to take a break. You will not only be satisfied with its comfort and functionality but also its reasonable price tag. Swivel mechanism with heavy duty nylon casters, and chrome base. An executive chair should not only look professional and impressive, but it should feel impressively comfy. Finding the best executive chair is a bit more involved than searching for other types of task or desk chairs. When searching for an executive chair, you are seeking options that have both the right ergonomics, as well as the right aesthetic. Executive chairs are typically high-back, and have a more plush, luxurious look. They are usually used in a work setting, but make a great addition to a home office. To aid in your search, we have compiled a short list of three of our favorites. All of the options we recommend receive top marks for style AND comfortability. The Alera Fraze High-Back Swivel/Tilt Chair is one of the most aesthetically pleasing executive chairs on the market. It is both professional and luxurious in appearance and makes a stylish addition to an upscale office setting. It offers both soft-touch leather upholstery and clean lines and is a favorite for offering all-day support and comfort. We also love the Alera Fraze because it isn’t just a pretty face, it is also supremely comfortable, using ultra-soft cushions, side bolsters and lumbar bolsters to provide maximum support for the sitter’s body. The waterfall seat edge also reduces pressure points at the back of the knees for improved circulation, which maintains comfort over the course of a long day. The casters are also sturdy and designed for easy mobility. With the Fraze, you can also customize the tilt of the back of the chair with the tension lever underneath the seat. One concern to take note of is that this chair can be a little difficult to assemble, as the 3 main parts of the chair each weigh an estimated 20 pounds. We recommend assembling with a partner who can assist with holding the three pieces in place. The Alera Fraze is available at a lower price on Amazon, which is why we love purchasing online. You also get the added bonus of almost 300 customer reviews, rating this chair at a solid 4.1 out of 5 stars. Ultra-soft cushions, side bolsters and lumbar bolsters for maximum suppport. Soft-touch leather upholstery for style and comfort. The Alera Ravino is another top of the line executive chair that should be on anyone’s shortlist when searching for this type of chair. It has a sleek, modern design with a pillow-top seat and back, providing plush comfort for long-term sitting. The Ravino also has open loop aluminum arms with padded armrests for a cleaner, more modern feel. The Ravino was made for comfort and the materials used are at par, if not better than those out there that are priced at double the cost. The reclining lever is easy to use and in a very intuitive, accessible spot. It is easy to adjust to find the proper tension for your back and create the best sitting experience possible. The customized positioning allow you to make the Ravino work for you, while you get some of your own work done. The Alera Ravino is available on Amazon and has a 4.0 out of 5 rating, with nearly 200 happy customer reviews. The Boss Black LeatherPlus executive chair is an ergonomic option with great lumbar support, fine leather and pneumatic seat height adjustment. Like the Fraze, it is designed with a waterfall seat to eliminate leg fatigue, which makes it especially comfortable to sit on for long periods of time. The Boss executive is made of high-grade leather, which make it look both elegant and high-end. Durability and quality both receive top marks, as all the plastic parts are made from hard structural plastics and are designed to last. The top selling point for this chair is its comfortability, due to its thoughtfully-designed lumbar support, which extends all the way up to the headrest. Consumers who work in an office can sit in this chair for hours and still feel supported and at ease. It also has several inches of padding, which makes it plush and comfortable. Another notable feature is that the Boss reclines up to 25 degrees, which has been shown to be the ideal range for most people. The chair height is also just right for average height to tall people; unfortunately, for people who are shorter than 5’6” this chair might be a little big.The LeatherPlus also has a 250-pound weight capacity, so you know its construction is both firm and durable. The Boss is also pretty easy to assemble; you won’t need any extra tools and it will only take you a few minutes – quick and easy with no hassle. This is a great chair for those specifically looking for a quality leather substitute and should definitely be on anyone’s short list. You can find it on Amazon at a low price point, you will certainly get your money’s worth for the chair’s comfort, durability, and high-quality. Buying a stylish $200 office chair and realizing a couple months later it gives you absolutely NO support. I did this! I had no idea what I was doing and suffered some serious lower back pain from sitting in an uncomfortable position. The chair looked amazing and I got suckered in. Faux black leather in a modern style. I felt like a boss in it but at the end of the day it was not a quality chair. I educated myself and replaced it. For the amount of time we all spend seated every day, $200 should be a no brainer. This is an investment in comfort and support. There are hundreds of chairs in this price point and separating the best from the rest of the field can be time-consuming. I have put together a comprehensive guide on the very best options every consumer should consider under $200. This price point is popular with companies seeking a large number of solid, supportive chairs for their employees and the options we compare in this category do not disappoint. Comfort is key when it comes to productivity and we believe comfort begins with the perfect desk chair. My personal pick from his list? The stylish and feature-rich Lorell executive high-back. You will feel like royalty when sitting in this style-conscious yet ergonomically-conscious chair. For full reviews and feature break downs on our three favorites for the $200 category, read on! The Lorell Executive High-Back Chair is an aesthetically beautiful chair, with a huge range of features for comfort maximization. 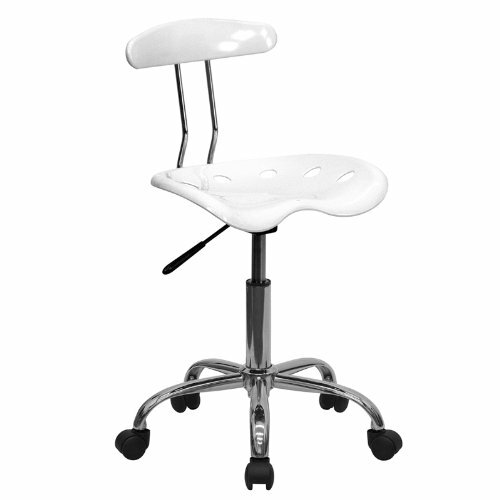 This chair consists of a nylon, five-star base with pneumatic seat height adjustment. It has product dimensions of 31.9 x 23.8 x 14.4 inches and weighs 50 pounds. Seat height from the floor adjusts from 17” to 21”. This chair is available in the black frame color only. If you’ve been experiencing the back pain or stiffness most office employees or home officer users suffer from, then this is a great chair for you. The Lorell high-back chair features an ergonomically-designed, tall back specifically designed to support the natural curvature of a person’s spine. It also features a 360-degree swivel, tilt and asynchronous three-lever control. This chair also allows full position customization; it is completely adjustable, allowing you to select the seat height, reclining back resistance, lumbar support, armrest height and width, forward recline angle, reclining depth, and backrest rigidity. Armchair adjustments are key for long-duration sitting to avoid shoulder and back strains. This chair has solid back support due to its nice smooth curve, which supports the full back through the mid and upper spine. The form of this chair provides support to keep the upper spine straighter, improving posture. The seat cushion is also soft and comfortably cushy. The Lorell high-back also meets the CA117 fire-retardant standard, which means it is difficult to burn, though it is not completely fire proof. Its cloth fabric also saves you from occasional snack stains by being especially easy to clean. This chair is also especially easy to assemble and you won’t need any special tools. It comes pre-assembled, you just need to pop on the casters, attach the arms and back, then stick the seat into the base. The Lorell High-Back Chair is a serious bargain for its body-conscious design, full customization and good looks. 360-degree swivel, tilt and asynchronous three-lever control Available in black frame only and meets the ca117 fire-retardant standard. The Office Star Professional is another high-quality chair that will appeal to a wide range of body types and cater to a plethora of support needs. The Space Processional weighs just a little over 40 lbs and its product dimensions are 20 x 21 x 19 inches. It has an eco-leather seat with mesh siding, a one-touch pneumatic seat height adjustment, and a 2-to-1 Synchro tilt control with adjustable tilt tension for a customized feel. This chair is only available in black, but is contemporary and stylishly designed. The quality of this chair is top notch and we think it even surpasses a lot of other chairs available at double the price. 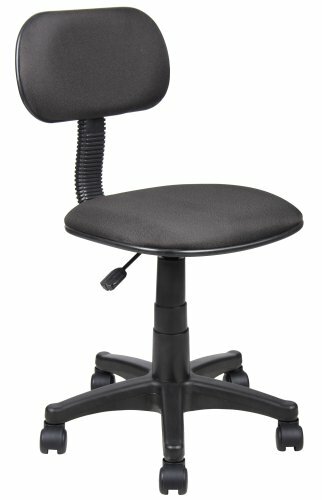 The lumbar support on the Office Star is solid and works well for both tall and average height people. There have been a few complaints that the chair may not be as comfortable for short people, so keep this in mind when purchasing! The leather seats are adequately padded, not overly hard and not too soft either. The chair is also easy to assemble and the instructions are straightforward, as reported by recent purchasers. You can pick up the OfficeStar Manager’s Chair on Amazon for a serious bargain for the quality, and comfort you’ll enjoy. It’s also rated at 4.3 out of 5 stars with more than 200+ reviews from its customers, a clear fan favorite. The High-Ribbed Executive office chair from Flash Furniture is another top quality, sturdy, and stylish high-back leather swivel chair in the $200 price category that we think makes an excellent addition to any company or home office setting. Our favorite chair in terms of expensive-looking sleek style, this option has a foam-molded back and seat with built-in lumbar support, a locking tilt mechanism for a mid-pivot knee tilt. It also has a coat rack across the back and dual-paddle control mechanism. This is a great contemporary piece of furniture that instantly elevates the style of any interior. It is available in both black and white and there’s also a mid-back version of this chair if a high-back is, well, too high for you. The mid-back version is also available in black or white. This is a sleek and simply designed, yet well conceived chair, that offers top levels of comfort and durability. The only downside is that it can become warm as the leather fabric is not as breathable and airy as the mesh alternatives. You can find this chair on Amazon with a 4.0 out of 5 star rating. This is definitely one of those stylish, modern, and affordable chairs that you can use to up the style factor of your office space while sitting in comfort. Ergonomics = back support heaven. Most posture problems stem from sitting in an uncomfortable chair for extended periods of time. Something most of us do all day, 5 days a week. Since we spend so much of our day sitting, whether at home or in the office, it is absolutely CRUCIAL to choose a chair with heavy focus on ergonomic comfort and support. With all the great technology available, companies have developed tons of adjustable features to fully maximize sitting comfort. But which ones should you focus on? Which features will really deliver the sitting experience you need? I have compiled reviews of 3 of the best ergonomic office chairs available on the market that I believe people with mid-range budgets should consider buying. These chairs are not only great to use while working at the office, but are also great considerations when searching for the best computer chairs since these allow you to sit for comfortably for hours when playing intense computer games or working electronically. All of the options this guide are produced with the core goals of maximization of comfort and encouragement of proper posture to avoid unnecessary and chronic back pain. Ergonomically-focused chairs are top picks for those objectives. 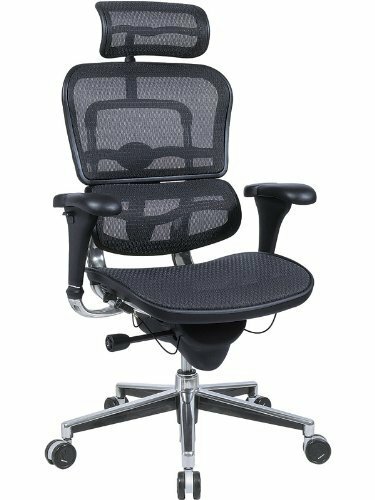 The Eurotech Ergohuman Mesh Ergonomic Chair features 8 ergonomic adjustments for maximum, customized comfort. Adjustable functions include tilt tension control, tilt lock, back angle, back height, synchro tilt, seat height, seat depth, and arm height. This chair is adjustable in every way imaginable to fit your unique size and all the controls are designed to be easy to reach and manipulate. The wheels are made of plastic but are large and have a rubber-like material coating them, which makes it easy to slide on a chair mat. This chair meets and even exceeds BIFMA standards. It is comprised of mesh seats and back, so you don’t need to worry about some of the maintenance issues that come with leather chairs. It also easy to clean, so it is a great option for users who eat at their office or computer table. It is also composed of sturdy polished aluminum, mesh and plastic parts, which make it durable and especially long-lasting. It features a chrome base with nylon casters and is made up of 97% recyclabe compnents. Actual assembly is very simple and will take you at most only 20 minutes. Eurotech warrants the original purchaser all components for the life of the product, except the upholstery and foam which will be warranted for five years. It is a true steal. It also received a solid 4 out of 5 star review from consumers. The Aeron Chair by Herman Miller is one of the best ergonomic chairs with the most insane high approval rate on the market. No other office chair works harder to relieve your back and neck pain than the Aeron chair. With its high-tech, patented mesh fabric, you can be sure that it will not look or function like your other conventional chairs. The patented material distributes the pressure evenly, keeping you cool and comfortable, no matter the environment. This chair also supports your posture at all times and is designed for a customized, fully-adjusted experience. The Herman Miller company has made sure that this chair could easily adapt and adjust to fit a person’s size, activity, posture, etc. all day long. With the Aeron you enjoy a stylish chair with top marks for durability, comfort, style, and best of all a 12-year factory warranty that covers everything, including casters, tilts, pneumatic cylinders, and all the moving mechanisms, so you can also be confident in your purchase and know that if anything should happen, there’s someone waiting to assist you. With the Aeron, you also enjoy the benefit of PostureFit, which supports the way your pelvis naturally tilts forward and allows your spine stay aligned to avoid back pain and discomfort. Assembly is especially straight-foward and will take 20 minutes tops to complete. Even though the Aeron is the most expensive option on our list, you can snag this jewel of the Herman Miller design crown for a steal on Amazon for its price. You save a little by purchasing it online from the comfort of your couch. The Aeron chair by Herman Miller is definitely worth a look and should be a serious contender on anyone’s short list for ergonomic superstars. The 12-Year Factory Warranty covers everything that makes a Herman Miller Office Chair–including casters, tilts, pneumatic cylinders, and all moving mechanisms. The Viva 00881 office chair is a tall back, adjustable beauty with contemporary styling. It is made up of standard and sandwich mesh which allows it to stay cool during warm weather. The mesh material also provides exceptional back support and prevents moisture build-up and works to disseminate and dispel body heat for users sitting for extended periods of time. This chair has a pneumatic seat height adjustment that can accommodate most sizes. It also has an adjustable headrest support, adjustable tilt tension and adjustable armest to suit your individual preference. The bulit-in lumbar support will also gradually help to improve your posture over time and ensure maximum comfort for extended sitting. It also offers high-quality polypropylene armrests, a nylon base and nylon casters which makes it a more affordable option, without sacrificing durability and quality where it matters. The Viva 00881 is a great example of a good quality, sturdy, comfort-focused chair that is still affordable for a range of budgets. The highlights of this chair are its price and comfortable head rest. It is also easy and quick to assemble. With its incredibly reasonable price on Amazon, the Viva is definitely the most affordable top ergonomic chair on our list. It also has a stellar 4.5 star average on Amazon, so you know you’ll enjoy top value for the money you spend. Aside from your bed, your office chair should be your body’s best friend. Don’t believe me? Most people spend over 9 hours a day just sitting. If it’s inevitable that you’ll be stationary for that much of your day, you might as well be comfortable. And being comfortable doesn’t have to come with an outrageous price tag. Sure, you can easily drop $1,000 on an office chair that will practically brush your teeth and bake you a cookie. It’s easy to find a comfortable option at that price point. But what about chairs under $100? Where to even begin to find one that will give you the support and comfort you need without falling apart within the first three months? Well, that’s what this post is for. To help you find a budget office chair that will last AND keep you comfy while you work. Considering purchasing chairs for a large office setting or just a single desk chair for your home study space? This guide is a compilation of the BEST 3 chairs within this price range that are consumer-tested and reviewed. I will break down all the major highlights of each chair, the features you should expect to find, the Amazon rating and the price. My personal favorite? The Flash Furniture mid-back chair with the chrome-base. This chair looks stylishly modern and is well-padded and constructed for ventilation so you feel comfortable for 5 plus hours at a time. I really can’t get over the low price tag either. All of these chairs are going to give you the most bang for your buck, perfect for companies purchasing chairs in bulk, or the home-office shopper with a budget. The Flash Furniture mid-back office chair with the chrome base is a great pick if you’re in the market for a supportive chair with a contemporary style. Mid-back chairs tend to provide more lumbar cushioning and are highly recommended if you are going to be sitting for long periods of time without a break. This option is affordably priced and comes in a wide array of colors – black, blue, white, green, red, yellow, orange, gray, burgundy, and black/burgundy to suit any decor style. Our favorite? The super modern white. This chair is constructed from a mesh fabric with a padded mesh and upholstered seat featuring built-in lumbar support and a tilt lock mechanism for customization of the seat back angle to suit your preferred reclining position. This is one of the most affordable chairs on our list. At this price point it’s pretty much impossible to find a better chair than the Flash. It is dream-like back support for a steal. Keep in mind, this office chair doesn’t have the dozens of customization features the higher-end brands like Aeron offer, BUT, this chair is a solid comfortable option with a reputation for durability and for the price, it is top of its category. Another highly-regarded and affordable chair is the LF-W23 mid-back mesh chair, also from Flash Furniture. A contemporary mesh back office chair with a padded seat and mesh fabric accents, this stylish option provides relaxing stationary support for those seeking all day comfort. The LF-W23 has a wide and cushy seat and full, supportive back. You have the option to purchase in 3 colors – red, blue, and gray/black. This chair also features an adjustable lumbar support, locking tilt control, and it is durably built. It can easily accommodate a large adult male and still be comfortable, which can be a common concern for taller or broader shoppers. The back support on this chair is particularly noteworthy, especially if you are a person with poor posture and a tendency to hunch your shoulders. The LF-W23 is designed to subtly position your body to naturally improve your posture, which reduces strain and stiffness in your lumbar region over time. The best part about the LF-W23 is that its not going to cost you an arm and a leg. You can purchase this chair for a serious bargain for a solid, durable office chair. I have always liked a chair that can recline a bit when I need to rest my back and take a break from my work. The O10 is incredibly comfortable, heavily padded, and has a great recline feature.The O10 has generously padded arms and a seat designed to provided cushy, maximized comfort for long-duration sitting. 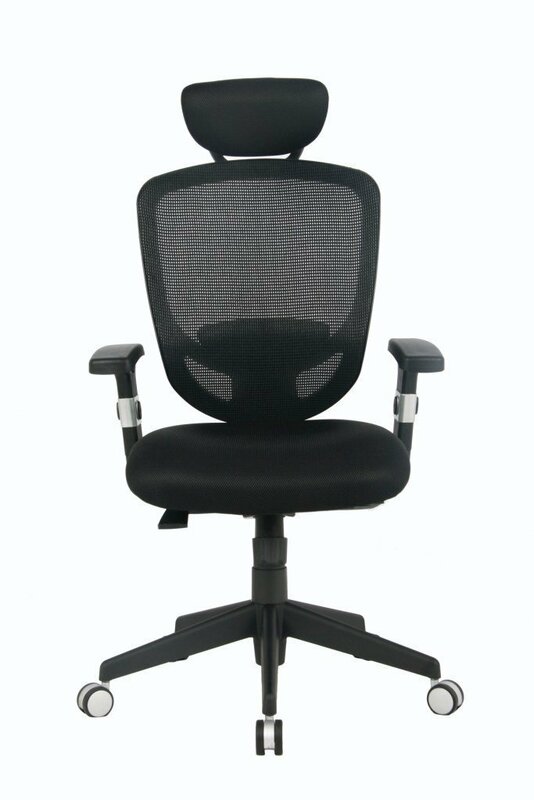 If you’re looking for a plush, padded office chair the High Back Executive Ergonomic Chair O10 should be a top contender. It is worth noting that some consumers have reported that when you first remove the chair from the packaging, it has a slight lingering smell of chemicals, most likely from manufacturing. It is not a huge concern for most purchasers, all of whom reported that it disappears over time. However, to eliminate the fresh new chair smell right away, purchasers recommend a quick spritz of Febreze. We find it to be a particularly minor complaint that can be overlooked for the price and quality of this chair. This is a solid office chair for less than 100 bucks. Once you sit on it and feel how it gently supports and cushions your body, you will swear you spent a lot more on it. This chair is our most wallet-friendly option. It also has over 100 reviews from consumers, earning a solid 4.2 out of 5 stars. The O10 comes in both brown and black, but price may vary depending on the color selected.